When Facebook acquired general app platform Snaptu early this year, it set the alarm bells ringing for millions of its users. But the bad news has just rolled out sometime back. Snaptu, positioned as a view-all, free to download app for basic phones that do not come with heavy inbuilt features of smartphones, is pulling out the plug that would disable access to almost all of the apps, in a week. It will completely focus on improving the Facebook experience on Java phones with the new Facebook app, which was first launched in January and updated in September. The message sent by Snaptu to its users reads: "On 11/11/11, we'll end most of our apps, including Twitter, Cricinfo, LinkedIn. These apps will no longer be available. 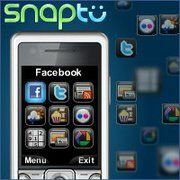 Snaptu is now part of Facebook, and we strongly encourage you to upgrade to our latest Facebook app." Linkedin was the latest of the services that Snaptu had added to its range. The two firms announced in March that the app would join over 30 other news, sport, weather and entertainment services already being offered via Snaptu. However it appears that all the services, including Picasa (by Google) and Flickr (by Yahoo!) will be stopped. In India, Snaptu had two million users as of October 2010 but no recent user numbers are available. In contrast BlackBerry has just about one million users in India. Snaptu was founded in 2007 as Moblica and is backed by Sequoia Capital and Carmel Ventures. The mobile app by the developer has grown rapidly to reach 78 million users globally, as of January 2011. Now Snaptu has around 1 million daily active users and 4.6 million monthly active users, according to AppData, which tracks traffic of Facebook apps. "We soon decided that working as part of the Facebook team offered the best opportunity to keep accelerating the pace of our product development," the company said in an official blog post about being acquired by Facebook for reportedly $70 million.